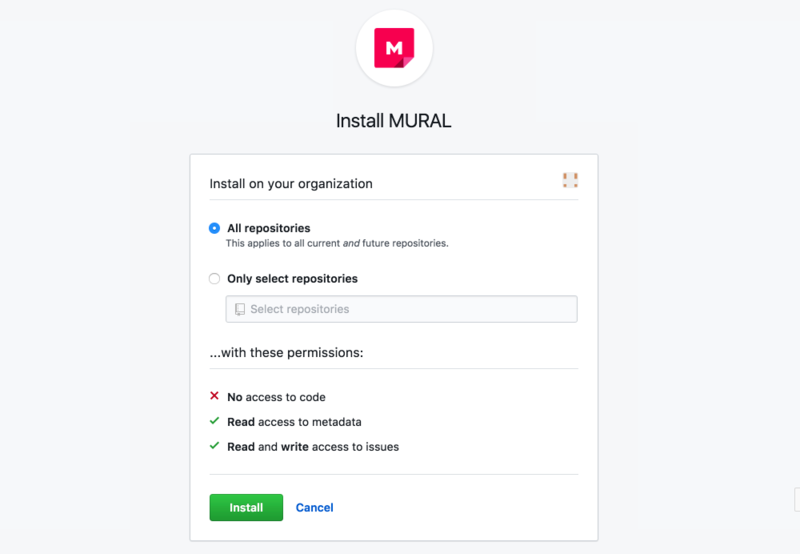 Seamlessly send MURAL content to GitHub. PART ONE: A GitHub organization owner must install the application for GitHub. 3. Choose your organization (If you don’t see your organization, you don’t have owner-level permissions. Send this article to somebody who does so they can complete this step). 4. Click 'All repositories' (recommended). Or, choose 'Only select repositories' to add just this repository now (you'll have to repeat this step for all new repositories later). Refresh any murals you had open. 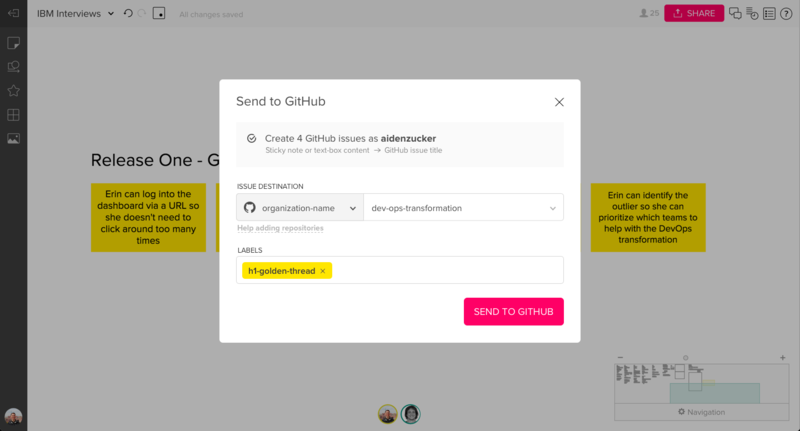 Now you and members of your GitHub organization can create GitHub issues from sticky notes and text boxes in murals by following part two. Multiple-select the stickies and/or textboxes you want to send. 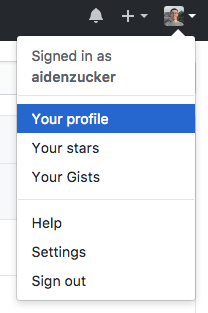 Right-click, and choose 'Send to GitHub'. 3. In the popup that appears, click 'Authorize tactivos'. 4. 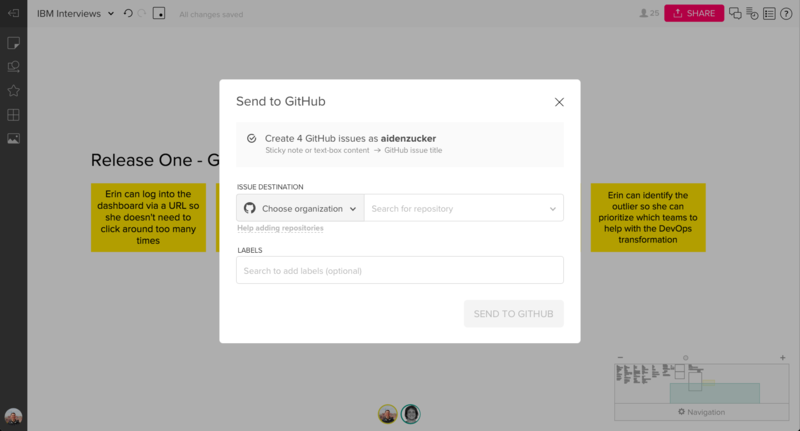 Use the dropdowns to choose the organization and repository you want to send the issues to. 5. Search for any labels you’d like to add (optional). 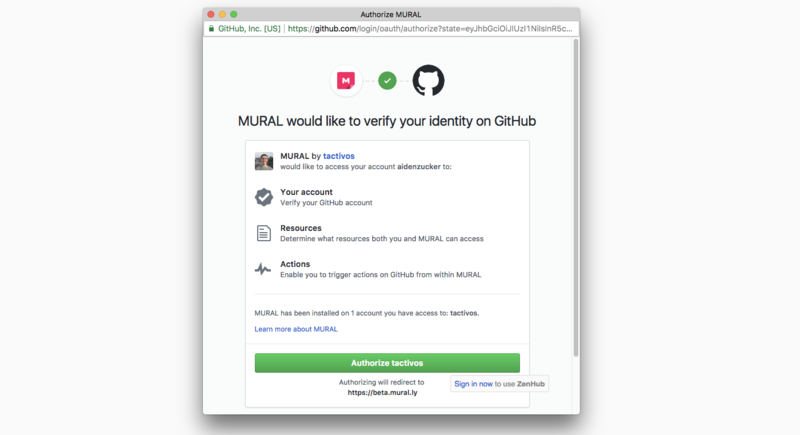 If you want to use a new label, create it in GitHub first, then reload the mural. 6. Click 'Send to GitHub'. 7. Click the link in the black dialog to see all of the issues you just created in GitHub. You can also click the tag to go to that specific issue in GitHub. Who is the GitHub organization owner of my repository? 3. On the left side of your profile page, under 'Organizations', click the icon for your organization. 6. You will see a list of the owners of your GitHub organization, any of whom will be able to complete Part One. Where is the repository I need? If you can’t find the repository you’re looking for, it’s possible that your organization hasn’t added it yet. A GitHub organization owner should complete Part One and give access to the repository you’re looking for. Now you're ready to manage your content across both platforms!